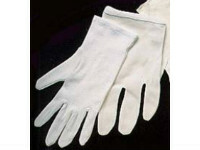 Emerald French Inspector’s Gloves or ‘waiter’s gloves’ are ideal for maintaining cleanliness and a sanitary environment. These gloves can be worn separately or used as a liner. Designed with breathability and comfort in mind, Emerald French Inspector’s gloves are made using a lightweight white cotton/poly blend. These gloves are designed to slip on and off easily and are ideal for general use including quality control inspections, dusting, handling electronics and wires, assembly, or other light duty applications. Available in Lady’s and Men’s sizes, Emerald French Inspector’s Gloves are packaged 100 dozen pairs per case.